Successfully Added PowerSaver - Wireless Energy Saving Monitor to your Shopping Cart. Reduce energy bills and improve Carbon Footprints with the PowerSaver Wireless Energy Saving Monitor! Do you know that your magnificent looking chandelier is burning 300 Watt-hours a day? And the air conditioner that brings you cool comfortable breeze consumes 180,000 Watt-hours per month? With the PowerSaver Wireless Energy saving Monitor, even users that thought they were running their home efficiently have found areas of savings! How does it work? It’s easy! The PowerSaver Wireless Energy Saving Monitor consists of an elegant wireless display and a transmitter with a sensor. The transmitter’s sensor clips easily around your home’s incoming power wires, and makes continuous measurements of your energy consumption. The real time consumption figure will then show on the wireless display, allowing you to monitor your electricity anytime. In addition, the PowerSaver stores and shows historical monthly/daily/hourly consumption figures. Simply set your local energy rate and let this monitor do the total cost calculation for you! By viewing historical data you will be able to make informed decisions on using electronic appliances more efficiently. Ergonomically designed and sturdily built, the PowerSaver will last for years of active use. Order your sample today and it gets shipped within 24 hours! Brought to you by your source for high quality low price electronics, Chinavasion. 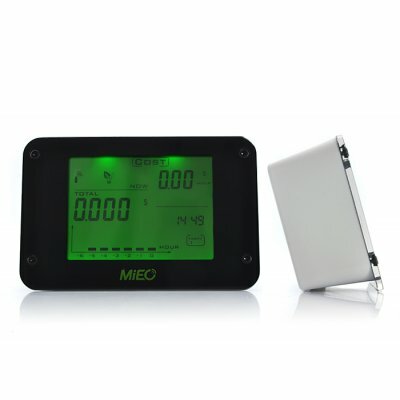 Note: This Wireless Energy Saving Monitor's can be used worldwide regardless of voltage differences. Installing the clamp sensor requires a certified electrician or a professional installer.